Life, liberty, and the pursuit of unselfishness. Ultima IV is one of the few games in history – upon its release in 1985 and today – that forces you to be a good guy or suffer the consequences. Compassion, Humility, Sacrifice, Spirituality, Honesty, Valor, Justice, and Honor are the virtues of the day. There is no wiggle room. In order to become the Avatar of the title (and win the respect and admiration of all of Britannia), you must achieve enlightenment in all eight virtues. This means: giving to beggars, being honest when townsfolk ask you questions, fleeing from non-evil creatures, sacrificing blood to those in need, meditating at shrines, and other high and lofty tasks. Man, Ultima‘s got my number. The game opens mysteriously. After questioning his surroundings via a second-person narrative, the main character – defined as “you” – finds his way to a fortuneteller’s tent. Inside, he’s asked several questions that, when answered, will link the player’s identity to one of the eight virtues. Virtues do more than define your character. Each one makes you start at a different location within Britannia and provides a character class, such as Ranger, Mage, Bard, etc. In addition to mastering the virtues, you also need to collect the eight Runes and learn the eight mantras, all of which are spread throughout Britannia. The Runes could literally be anywhere and it will take a good deal of SEARCHing and patience to obtain them all. The mantras, however, can be found just by talking to people in the towns. As you roam hither and yon through Britannia, you’ll inevitably come across creatures, both evil and neutral. Evil creatures, like orcs and skeletons, should be vanquished post haste to increase your Valor, while people and innocent wildlife should be left alone (even if they attack you!) to increase your Justice. Alas, battles are a necessary evil, but you don’t have to wander Britannia alone. Seven additional companions can be acquired along the way to help ease your fighting pains. Bum rush those Orcs, Finnegan. 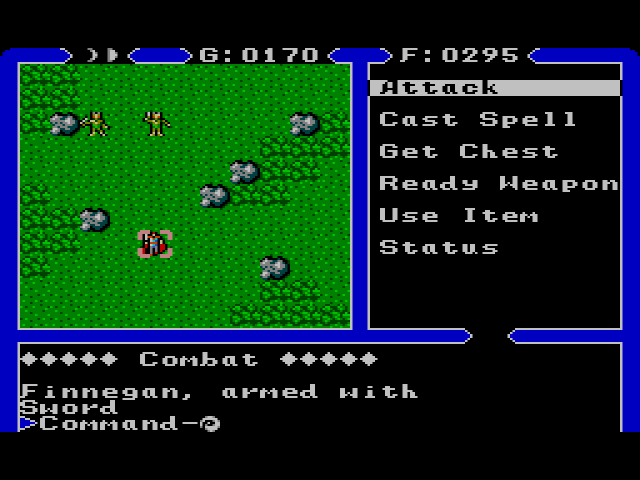 Ultima IV also employs a ‘reagant’ system, where the player mixes random “earthy” ingredients together to prepare magic spells. There are eight reagants in total, ranging from roots like Ginseng to, er, Sulfurous Ash. By mixing several of these reagants, you can make up to twenty-six spells, one for each letter in the alphabet. Applause, applause for the inclusion of alchemy here, but it really should have been optional. Being forced to make spells over and over again just so you can make your way through the world is the height of tedium. It helps to have mixtures before you try to cast a spell. And what classic CRPG would be complete without dungeons to explore and treasure to find? 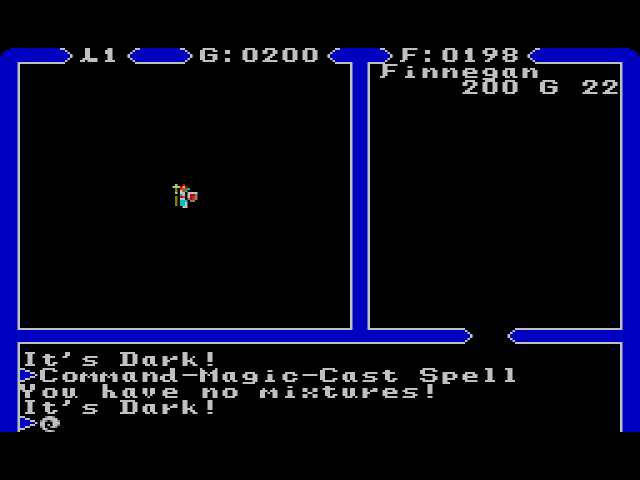 Within the dungeons in Ultima IV are eight colored stones. These stones are needed to unlock the artifacts of truth, love and courage. Fight enemies, SEARCH in every corridor, and get the hell out of there once you have the stone. The dungeons aren’t poorly designed, but the emphasis on combat and exploration is draining, even with companions helping you out. 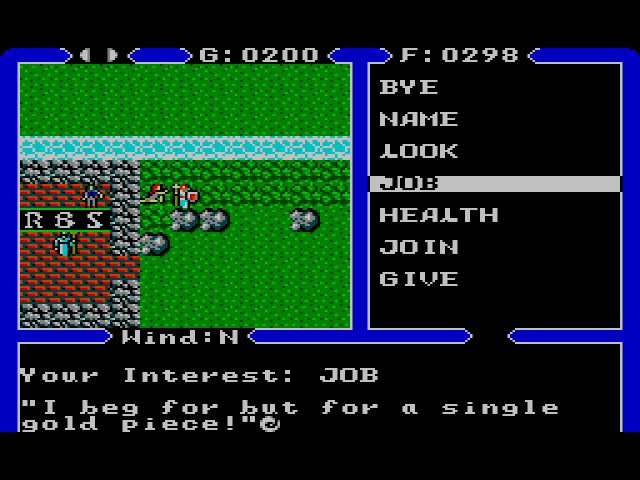 One of the many groundbreaking features of Ultima IV – to my console gamer sensibilities anyway – is its freedom. Your objectives are few, and you’re allowed to complete them in whatever order you wish within reason. For some, this is free-roaming heaven. For me, this means stumbling around and trying to figure out what I’m doing. Exploring Britannia at one’s leisure surely enthralled fans upon the game’s release, but I’ll take direction and hand-holding over unprecedented freedom any day. The man who made morality fashionable again! Released a full five years after the original Apple II version, the Master System version of Ultima IV is supposedly the best of the best. I’ve only played the less-than-faithful NES port, so I can’t attest to that, but the SMS port certainly looks like an enhanced version. The tile graphics have been redrawn, but otherwise reflect the original’s look. The NPC conversations are more limited than the PC versions, but I actually prefer the streamlined dialogue; all meat, no fat. And the dungeons are no longer shown from first-person, but top-down. This gives you a wider range of vision and makes them easier to navigate. This is your brain on death. 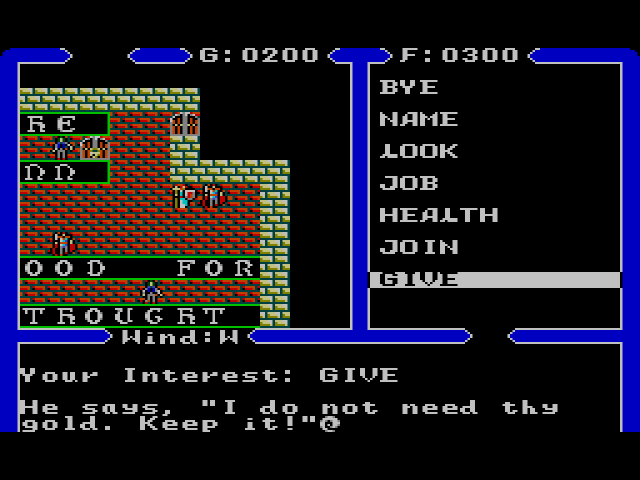 Even with the engaging morality system and the tweaks the Master System version provides to accommodate console players, Ultima IV‘s antiquated CRPG feel is like kryptonite to me. Tile graphics resulting in choppy movement? Barf. 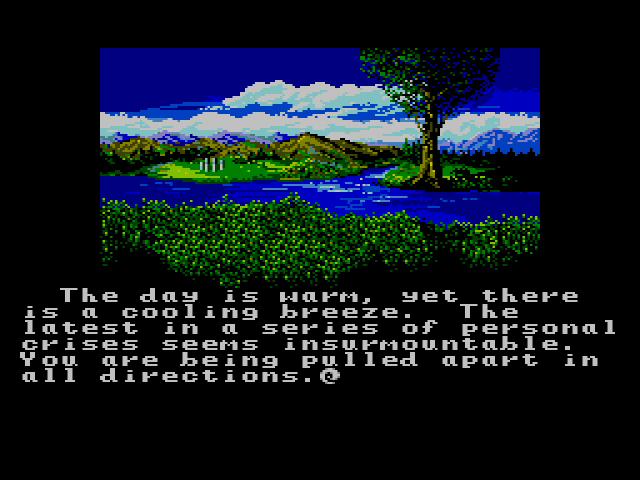 Britannia may have been entrancing in 1985, but it’s hard to walk through the game’s forests today without getting a headache. Figure out where you need to go and what you need to do with little assistance? Lord British have mercy. This “make your own adventure” nonsense was all the rage in the mid-80s, even on consoles (most famously: The Legend of Zelda). As a kid, this freedom overwhelmed me, and as an adult, I really don’t have time to uncover a game’s mysteries without a thorough FAQ. I’d be an ignorant contrarian to deny Ultima IV‘s contributions to gaming history, but distant admiration is the strongest feeling I can conjure for Quest of the Avatar. The game is legendary, and it’s absolutely not for me. I knew this one would be controversial, hence the “no grade” grade. Sorry my response was snarky. I always try to take into account when the game was created, but if I find little to no enjoyment of the game today, I think that’s very important to note too. Some of the most groundbreaking games have aged quite poorly. Thanks for the comments, Ben, cheers. I’ve found this one equally difficult to revisit in the DOS version that is available *for free* on GOG.com for those interested. Maybe a fantastic desert island type of game thirty years ago, but in 2016 it’s best left on a timeline which ends in something like Skyrim or Divinity: Original Sin. Been waiting for this review for a while. Where do I start. I remember seeing a preview in a magazine and just had to have it. Unfortunately, Sega of America decided not to bring it over. That did not stop me however, I imported it from Funcoland (anyone remember that mail order company?) as my very first import. The graphics and game play have not aged well and I probably will never tough this out again for fear of destroying my pleasant childhood memories. The openness did overwhelm me and I think it took a full two years to finally finish. Quite a feat considering back then there was no internet to cheat with. At the end of the game it asks you a bizarre question like ‘what encompasses all’ and you had to input your answer as a word. I had no idea and was stuck on this forever. I finally figured it out by calling the hint line of the company that published the Nintendo version, FCI, and asking them. I was hoping the two games were similar enough that they would have the answer. Turns out they did and I finally got through that monster. The last dungeon was merciless because if you answered the question wrong you had to start at the beginning of the dungeon where you last could save it. This was an example of my dedication and patience to stick with a game until the end back then, unlike today’s ubiquitous games where the low attention span of this generation’s average gamer would move on without a lot of hand holding. I love this comment. Thanks for sharing. So despite this not being your type of game, would you recommend it over the NES version. And would you compare it favorably to “Miracle Warriors”? 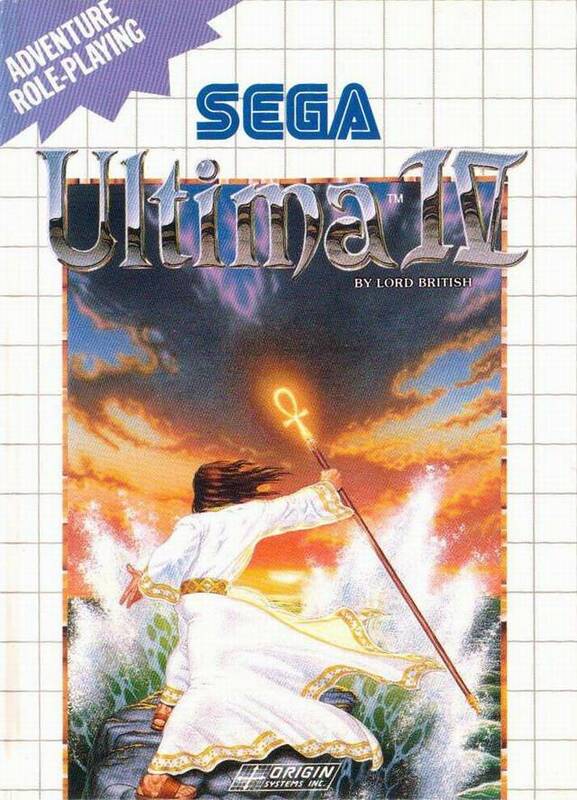 I’d play Ultima a thousand times over before I play Miracle Warriors again. And I think I prefer the NES version more. When I was in middle school, I’d hear my friends talking about how cool their computer games Like Ultima were. I really wanted to try them. By the time this came out on the SMS I think I probrably didn’t care anymore. I’d moved on to the Genesis and was playing much more graphically impressive RPG’s. I’m sure if this had come put in 87 or 88 I would have purchased it though. Yeah, ’90 was definitely too late for this one. Phantasy Star blew this game away and it came out three years prior. You’re not missing much. 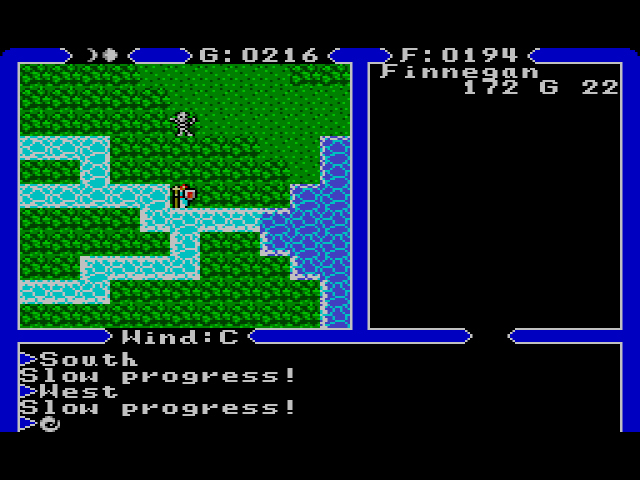 I still love Ultima IV enough to have sunk huge time into two almost-plays-through in the last few years. The first one ended when I turned my PSP off mid-save after reaching full enlightenment, most of the stones (different than the runes), the hot air balloon etc. Lost everything. The second after making almost as much progress then discovering the ROM was corrupted and the white stone couldn’t be collected. I did finish it back in the day, on the original SMS hardware. I still own the Apple II version complete in box. The main disc (the “Britannia” disc, naturally) became corrupted after some three years of solid play, such that ships no longer appear. My Ultima V dungeon disc never worked, although the DOS version works on my phone. Seems I have a checkered history with these games. The “figure it out for yourself RPG” is never going to be my cup of coffee, I’m afraid. Fair enough! I wonder if you’d like Ultima Underworld – it’s a real time fully 3D dungeon crawler (it has a Z axis) that’s heavy on puzzles and character interaction. The 1992 graphics have aged badly but it plays really well. Maybe! I like antiquated dungeon crawlers. This one’s a game to enjoy when you want to believe there’s an entire world that exists beyond the gameplay mechanics. As a kid, Ultima III on the NES seemed like the closest I could get to The NeverEnding Story – there were so many options that had absolutely nothing to do with winning or losing. Just mounting my horse and seeking the moongates was an adventure that nothing else could compete with. But that was a long time ago. I’m older now, and had my share of real life adventure. How can a humble videogame begin to compete with just the many things a real life NPC can do? They may even join your party, and bump the rating up to an Adults Only affair. I’d rather 8-bit try to be it’s own thing.